Skywatchers will enjoy a rare space triple-header Friday night and early Saturday morning: A “penumbra” lunar eclipse during the full “snow” moon — and the flyby of a comet. Eagle-eyed skywatchers will see a “penumbral” lunar eclipse Friday evening during the full moon. Not as spectacular — or noticeable — as a total lunar eclipse, this rather subtle phenomenon occurs when the moon moves through the outer part of Earth’s shadow (known as the penumbra), according to EarthSky.org. The outer shadow of the Earth blocks part — but not all — of the sun’s rays from reaching the moon, making it appear slightly darker than usual. The exact moment of the penumbral eclipse is 7:43 p.m. ET (6:43 p.m. CT, 5:43 p.m. MT and 4:43 p.m. PT), NASA said. 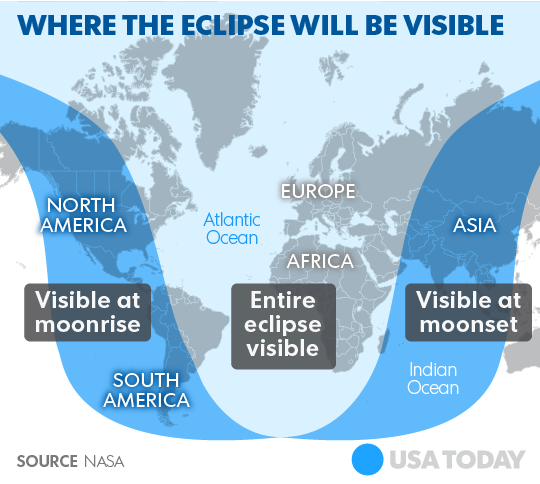 The eclipse will be visible from Europe, Africa, western Asia and eastern North and South America, NASA reports. 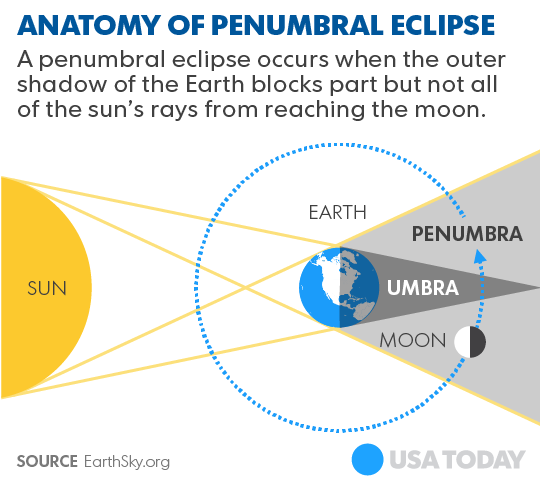 About 35% of all eclipses are of the penumbral type. As required during any lunar eclipse, the moon will be full Friday night. 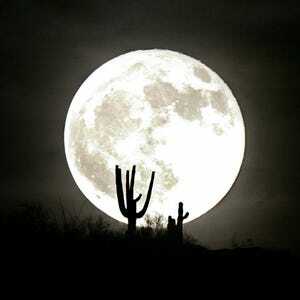 And this month it’s nicknamed the “snow” moon. According to the Farmers’ Almanac, full moon names date back to Native Americans in the northern and eastern U.S. Each full moon has its own name. Calling February’s full moon the “snow” moon is right on target: On average, February is the USA’s snowiest month, according to data from the National Weather Service. 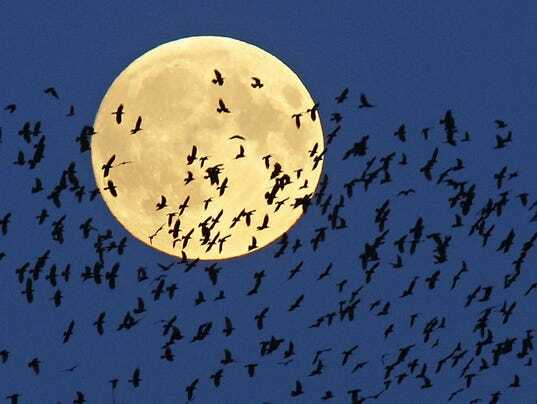 The Farmer’s Almanac reports some tribes referred to February’s moon as the “hunger” moon, because harsh weather conditions made hunting difficult. A few hours after the eclipse, Comet 45P, which has been visible after sunset for the past two months through binoculars and telescopes, makes its closest approach to Earth, when it will be “only” 7.4 million miles away, NASA said. 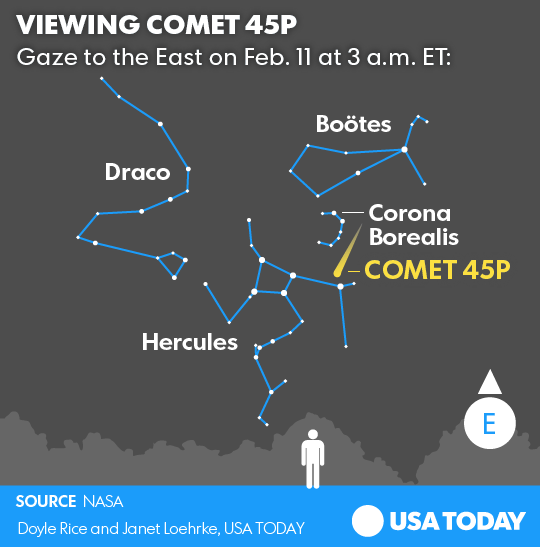 Look to the east around 3 a.m. Saturday morning, where it will be visible in the sky in the constellation Hercules. Binoculars or a telescope could be helpful. Watch for a bright blue-green “head” with a tail. It will be visible in various points of the night sky until the end of February, according to NASA. 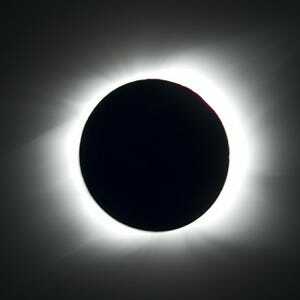 If you miss it, don’t worry: It will return again in 2022, said Jane Houston Jones of NASA’s Jet Propulsion Laboratory.